6 types jewellery every Indian woman should have! Now a days Indian woman are giving more importance to their jewellery. They buy a jewellery and match it with any dress of that suits it rather than matching the jewellery with the outfit. 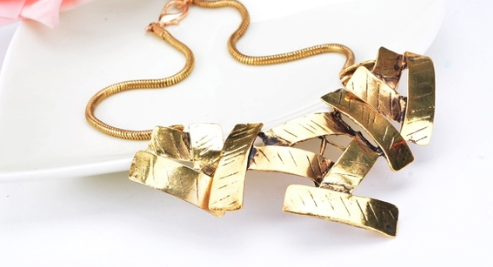 A good piece of necklace or an earring definitely compliments and elevate any outfit. Here we give you the 6 must have pieces of jewellery that every woman should have. Jhumkas: No function or traditional occasion is complete without spotting beautiful looking saree clad Indian women without jhumkas. Though there are many different version of this classic piece of jewellery, the basic trend of wearing this earrings remains the same. This stud with an umbrella like hanging at the bottom has many versions ranging from plain gold, antique gold with subtle use of stones, diamond studded with pearl hanging and kemp stone studded ones. 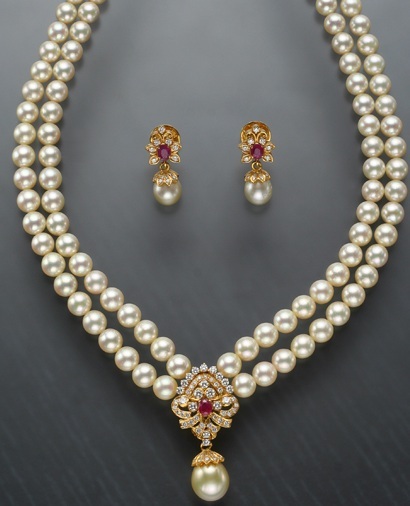 A set of pearls: Pearl symbolises purity and beauty. The lovely color of the pearl accentuates any look. A string of plain pearl necklace set is a must have in your jewellery box. They go well with western outfits and gives the wearer an elegant look! If you don’t know what to wear, go for pearls. Terracota jewellery: Now more and more women are becoming eco friendly and want to go for hand loom cottons and ahimsa silks. The same trend has been catching up in the jewellery industry as well. And the result – beautiful and earthy terra-cotta jewellery. This jewellery is handmade with clay and beautifully painted with lovely Indian colors. These are pocket friendly as well! Statement Necklaces: These are the newer trend. From peter pan collar necklaces to neon coloured chic metallic pieces, these statement necklaces are available in wide varieties. These are called statement necklaces as they do not require any other huge piece of jewellery. These can be worn with chiffon/printed sarees or western wears. Avoid huge or dangling earrings. Hand Jewellery: A chunky finger ring that adorn your long fingers will put your taste in accessories at a whole new level! A beautiful intricately carved finger ring with kemp or ruby stones or a onyx or a turquoise studded ring is a must have for any season and for any trend. If you would like to buy this, visit here. Shining Stars: A set of delicate necklace studded with american diamonds are a life saver for any evening party! 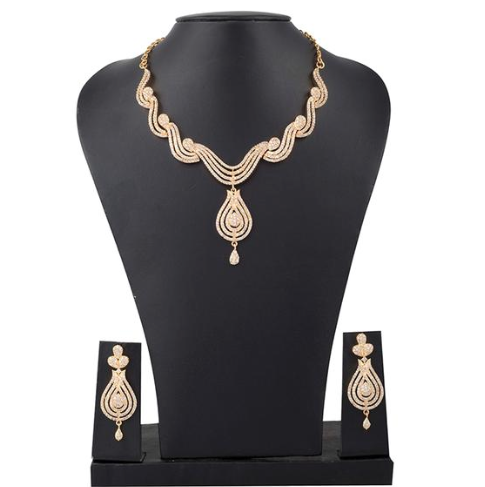 To accessorize your designer saree or the lovely anarkali you bought recently, go for these kind of necklace sets without much doubt. But remember to invest in a necklace which is unique and has good quality stones! If you ain’t got them all your jewellery collection is not complete! Kundan ( K-uu-n-d-uh-n ) The word kundan means highly refined gold, and a highly refined and pure form of molten gold is used. 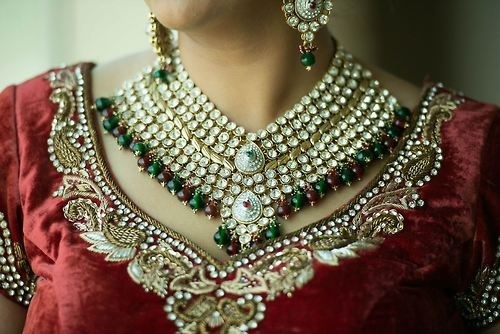 Kundan jewelry is a style of jewelry made with techniques native to India. The history of kundan jewelry making in India dates back several thousand years to the Mughal Empire and Dynasty period in India, between 1526 and 1858. It flourished in greatly in the Mughal era as it received royal patronage with the most intricate form of Indian Gem Stone, and is the oldest form of jewelry made and worn in India, still in use. 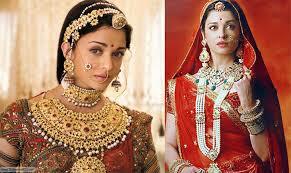 During Mughal period, the art of kundan work reached Rajasthan from Delhi. Later on, craftsmen from the different part of the country migrated to the place and made Rajasthan a hub of Kundankari. Over the years the kundan jewellery of the courts was successfully copied in silver in Rajasthan, Bihar and the Punjab states and became popular with common man as well. Pachchikam is one such variation of Kundan Jewelry. Today, it is known world over and Rajasthan is considered to be the centre for the best kundankari workmanship. There are many styles and variations in Kundan work, with the meena kundan being considered the most traditional. In this style, the stones are encrusted on one side and the reverse is decorated with elaborate enamel or meenakari work. It is said that the meenakari was a way of adding to the beauty of the kundan jewelry. But overtime it came to be as much admired as the kundan itself. Traditional kundan jewelry has stones encrusted on one side and colorful and intricate meenakari on the reverse. The entire technique of Kundankari lies in the skillful setting of gems and stones in gold, which is rarely solid. Holes are cut for the gems, engraving is carried out and the pieces are enameled. The core of the ornament is made out of lac, a natural resin. Later, lac is inserted into the hollow parts and is then visible from the front, through the holes left for the gems. Highly refined gold or kundan is used to cover the lac and gems are then pushed into the kundan. To increase the strength of the joints and to give it a smooth finish, more kundan is applied. Kundankari is such a specialized work that it is carried by a group of craftsmen, each carrying out a specific task. The chiterias make the basic design, the ghaarias are responsible for engraving and making holes, meenakari or enameling is done by the enameller and the goldsmith takes care of the Kundan or gold. The jadiyas or stone setters, set stones such as jade, agate, garnet, emerald, rock crystal, topaz, amethyst, and spinel into kundan. 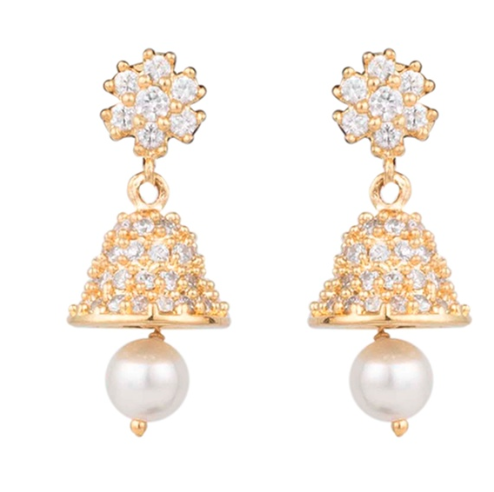 With kundan jewelry, even the smallest piece is elaborate. It definitely can’t be termed as light jewelry. So it calls for a special occasion to bring out that kundan set.